One of the benefits of constructing the rankings is that you get a dataset that allows you to do some assessment. You'll notice that I use the word "assessment" rather than "analysis". The reason for that is that currently the dataset is too small for any statistical confidence to be applied and....more importantly....there is a wide spread of variables that have to be considered. The rankings are based purely on that. Player ranking at the end of the event. Therefore it is not just Battle but Presentation and Sports. Each TO has their own scoring rubric and so apples are not always being compared with apples....sometimes it can be tangerines. This is constructed taking the best ten results for each army excluding that of the person holding the Army Icon. The exclusion is a blunt instrument to limit the impact of player skill (i.e. you might have one player who is very good with the army putting an undue skew on results). # is the number of inputs that go into making up the score. For instance, for Undead the ten best scores were taken from 53 inputs. I have only included those Armies that have 25+ inputs from which their score is drawn. The results show some quite interesting "banding" for armies with a similar number of inputs. My gut feel is that the Undead result has been built on De 6+ Vampires and we may see them come back to the pack with the recent COK 2017 changes. Elves were higher ranked in the past and I believe that their current ranking reflects changes to Flyers (impacting their Dragon and Draakon builds) and probably more importantly, people learning to play against their strengths - they were very successful when the current edition dropped. 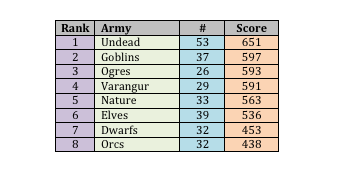 Based on the variation, a case can be made that Dwarfs and Orcs are currently underperforming relative to the other armies. In some cases this may be due to the....let's put this diplomatically...the playstyle of the players using them. It will be interesting to see if the changes to Orcs give them a boost. As noted there are too many variables to make any definitive statements but I'll be keeping an eye on any changes over coming months. "In some cases this may be due to the....let's put this diplomatically...the playstyle of the players using them. " Intrigued by this comment. Your views on Dwarf players are well known, but what have Orc players even done to you? Memories of Green Dwarves from WHFB? No Abyssal Dwarves - seems plausibly at odds with the lonewolf results! Is this game balanced or something? !